Gillespie’s biggest takeaway from the scouts was learning to take initiative. 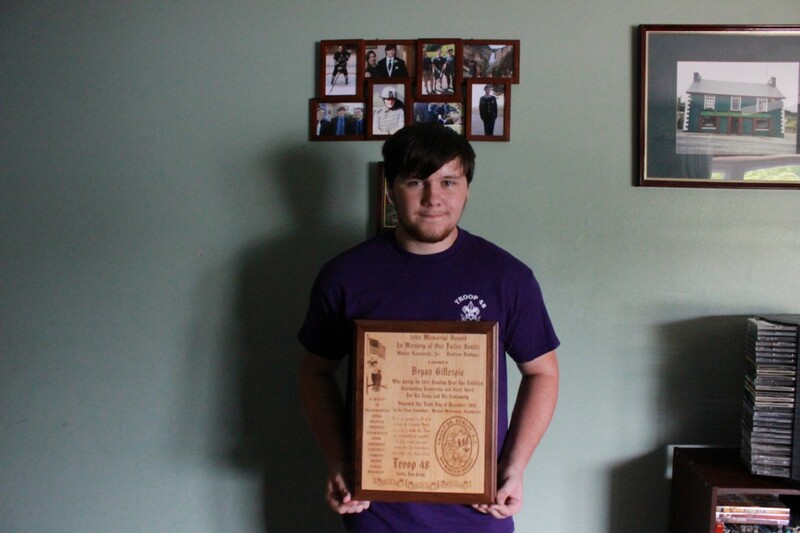 Bryan Gillespie, 18, recently received his Eagle Scout Award after finishing his Eagle project. The Berlin resident’s Eagle Project involved pushing back the tree line for the Rut Research Station and removing the non-indigenous Sumach species. Pushing back the tree line took lots of preparation and organization of volunteers. Before Gillespie was able to move forward with the project, he wrote the proposal and presented it in front of the Boy Scout Council. His proposal was passed and he was able to begin organizing the project and getting volunteers. On the day the tree line was pushed back, Gillespie had 40 volunteers. Gillespie has been involved with Scouting for 13 years, and it has made a tremendous impact on him. Over the years, he has partaken in several projects and had many memorable experiences. Among these experiences has been bunking in the Battleship New Jersey and running the rest stops at the MS 150-mile bike ride. Troop 48 has repainted the train station in town and has paved several trails. Gillespie has backpacked more than 400 miles. Most of these miles have been on the Appalachian Trail, while 60 were on trails in Washington state. Gillespie’s biggest takeaway from the Scouts was learning to take initiative. What he’ll miss the most are the bonds that have been formed over the years. “I made a lot of friends [in Scouting] … I’ve had two really close friends that I’ve gone through the Scouts with … I’m going to miss them,” he said. In the fall, Gillespie will attend Penn State University for mechanical engineering. While at PSU, he will be a part of the ROTC program. Post-graduation, he will go into the Army as a second lieutenant mechanical engineer. “I’ve had a lot of family in the Army … I know I’ve always wanted to be in the Army since I was very young,” he said.